DELMARVA VETERAN BUILDERS ADD FOUR NEW EMPLOYEES TO THE TEAM. SALISBURY, Md. 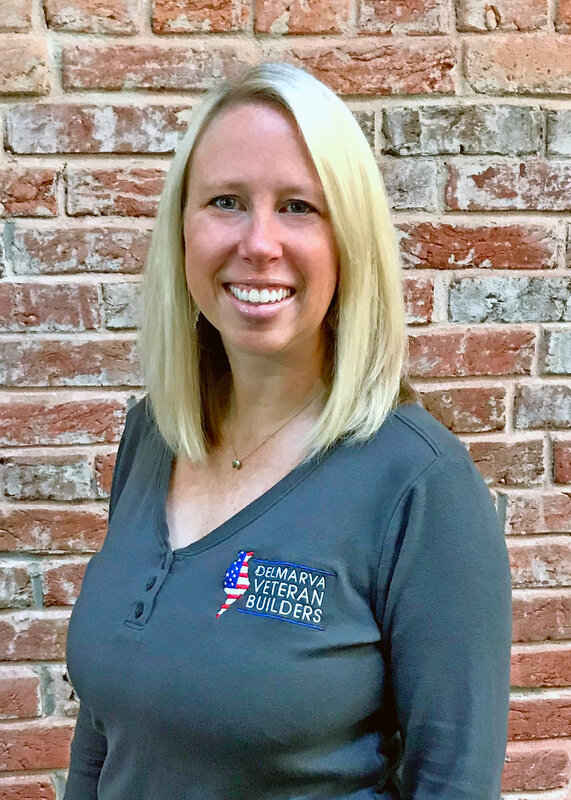 – January 25th, 2019 – Delmarva Veteran Builders, the region’s only commercial construction firm dedicated to bringing employment to U.S. Armed Forces Veterans, announced the addition of Gen Chamberlain, Daniel Burton, Jenny Kerr Schroen, and Patrick Spence to the team. Gen Chamberlain will be diving right in with the accounts division, working alongside Office Manager Heather Welch. Gen is a native of Salisbury and an Alumnus of Salisbury University where she received both her bachelor’s and master’s degree in Education. She taught for 10 years at St. Francis de Sales and three years at Woodson Elementary in Crisfield. Gen and her husband Nick live near the university with their two children, Bella and Beckett. In her spare time, Gen loves spending time with family and friends. Daniel Burton started on January 18th as DVB’s new Project Manager. He medically retired after serving for 12 years in Army Aviation, where he completed three deployments to both Iraq and Afghanistan. Relocating to Salisbury, he brings his wife and three daughters while currently finishing up a degree in Psychology. Growing up in Stone Mountain, Georgia, his father was in the commercial construction industry where Daniel would oftentimes accompany him to job sites. He has since worked as both a foreman and superintendent for a residential construction company in Athens, Georgia. In his spare time Daniel enjoys watching sports and outdoor activities like camping, hiking, hunting and fishing. Jenny Kerr Schroen began 2019 as DVB’s new creative and marketing developer. Jenny is a native of Covington, Kentucky and received her B.A. in graphic design from Flagler College in St. Augustine, Florida. She has 16 years of experience in the graphic design industry. Out of college, she designed for a leading real estate design firm in Jacksonville, Florida. Jenny’s career has taken her throughout the country, including Cincinnati, Los Angeles and San Francisco. For the past three years, she has been designing for Close Quarters Defense in Vienna. Jenny lives in Salisbury with her husband, J.D. and their four children, Olivia, Ethan, Gavin and Braden. She enjoys traveling with family, mid-century modern furniture and extreme sports like surfing and wakeboarding. Patrick Spence joined DVB on January 21st as their new estimator. Pat has a rich history of military service, joining the Navy right out of high school. He was deployed on the USS Enterprise as an Aviation Ordnanceman. Already overseas during 9/11, he had the honor to be a part of the first global response to the attack, which came to be known as “Operation Enduring Freedom”. After leaving the Navy in 2003, he joined the elevator trade as a project manager. His past experience led him to construction estimating while earning a degree in construction management before making the move to Delmarva Veteran Builders. “I love the idea of working with fellow service members again.” says Patrick. Pat has a 15 year old son named Ethan and enjoys spending time with friends and family.